However, within days they were building a golden calf to worship. 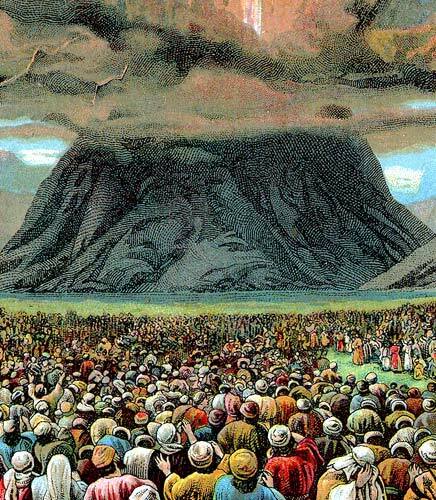 More staggering, the elders of Israel themselves saw God: “Then Moses went up with Aaron, Nadab and Abihu, and seventy of the elders of Israel, and they saw the God of Israel; and under His feet there appeared to be a pavement of sapphire, as clear as the sky itself” (Ex. 24: 9-10). (On a side note, this is one the most amazing verses in the whole Bible, in my opinion.) Here these 70 plus men get to look at God and not die. They saw God and days later they were participating in mutiny against Him. God noted the same when he said to Moses, speaking of the people worshiping an idol, “They have quickly turned aside from the way which I commanded them” (Ex. 32:8). At first it’s hard for me to fathom that kind of unfaithfulness, in light of the unbelievable closeness of the presence of God. But then I think about my own heart. We may not have seen God, but we live on this side of the cross and the resurrection, and don’t we all, at times, act just like the Israelites did, under the shadow of Sinai? Are you planning a Joshua march through the world/your country/your city/your village/ your locality/ your workplace, to bring down walls of hostility against the Word of God, and to come to the promised land.